David Kauffman is principal of Lance Corporal Nicholas S. Perez Elementary School in the Austin Independent School District. Through collaboration with parents and community members, his school has developed a nature trail, a courtyard pond, an outdoor classroom, and other outdoor learning spaces. He is committed to students having opportunities to learn in and from nature. David joined the Westcave Board in 2013. He also serves on the Advisory Board for the Harvard University Principals Center. 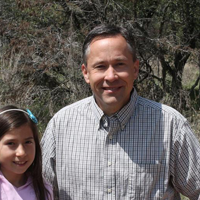 In 2013, he was named the AISD Principal of the Year. He is an alumnus of Stanford University and Harvard University.